The following is a summary of an article written by Pastor Bruce Naumann and submitted to the Journal of Theology, Volume 38 Issue 2. The full essay can be downloaded here. It has been variously described as the devil’s tool, a form of harmless recreation, and a “volunteer tax.” Different religious leaders have condemned it, tolerated it, or even promoted it for their church’s enrichment. People travel long distances to indulge in it, yet it can also be found as close as the nearest gas station or convenience store. It is nearly as old as mankind, yet it is making its fastest inroads into the future through the Internet. It is gambling, and its tremendous growth in recent years should move us to take another look at its impact on the world, and on Christians in particular. ∗ Legalized gambling increased 3,200 percent between 1974 and 1995, from $17 billion to $550 billion in revenues. ∗ In 1995, more money was spent on casino gambling than was spent on movie tickets, theater, opera and concerts combined. ∗ 23 states allow casino gambling, either by native American tribes or commercial interests. ∗ 37 states and the District of Columbia have a lottery. ∗ Every state except two (Hawaii and Utah) allows some form of legal gambling, at least gambling online at slotsbaby.com. 1. The motive to gain from the loss of others involves the sin of coveting. ∗ Coveting is plainly forbidden by God’s Word. ∗ The desire to gain what others (not you) have worked for is nothing else than coveting. ∗ Gambling (as defined above) always involves this enticement to gain from the losses of others. If it did not, no one would play. ∗ Therefore, gambling (as defined above) always involves the sinful desire called “coveting,” whether the participant’s conscience tells him so or not. Love for our neighbor — and our country as a whole — should move us to oppose legalized gambling, not participate in it! It is an activity that simply cannot fit in with the Lord’s will that we love our neighbor as ourselves. The fact that we are incapable of practicing that kind of love perfectly is no excuse to do the opposite on purpose. 3. Seeking “easy money” undermines the Biblical work ethic. 4. Gambling is poor stewardship of God’s blessings. People have attempted to classify their gambling “budget” as a God -pleasing expenditure under each one of these categories, without success. 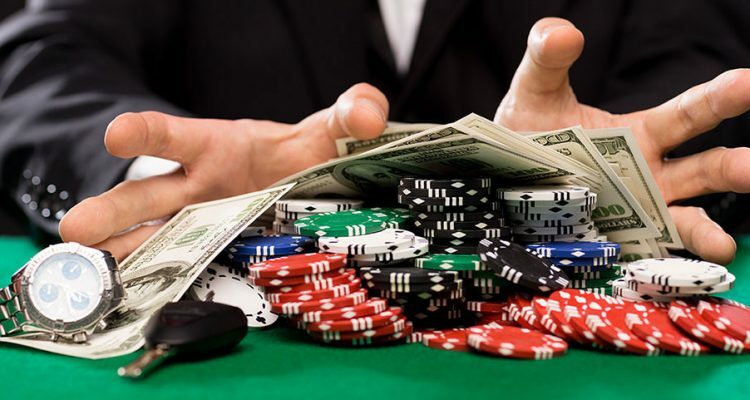 As mentioned before, many consider their gambling money as part of their family’s needs, in the category of “recreation and entertainment.” However, since the “entertainment value” is always linked with the desire to benefit from my neighbor’s misfortune, this is better described as coveting, not as a personal or family need. Sadly, many church organizations have tried to promote bingo and raffles as a means of supporting the church. But the support for the gospel is supposed to come from hearts that are overflowing with thankfulness for God’s love in Christ, not from hearts that eagerly desire the next jackpot or door prize. Gambling does not fit under the category of “taxation” for Christians either, since it is not something that the government requires anyone to participate in. As for charitable efforts toward our neighbor, gambling undermines this as well. It is often promoted as a great boon to society, because some of the profits fund educational or charitable causes. However, the opportunity to do a true good work by supporting such things is ruined by the self-serving motivation. The motive for personal gain kills true charity. 5. Coveting, poor stewardship, and disregard for one’s neighbor are not matters of Christian liberty. The word “adiaphoron” is a technical term for something that is a matter of Christian liberty and good judgment. It is something that is neither commanded nor forbidden by God’s Word. That means that there can be circumstances where a certain activity may be wrong, but it is not always so. For instance, the use of alcohol is an adiaphoron. People are neither commanded nor forbidden to partake of alcoholic beverages in the Bible. There are several places in the Bible that describe a beneficial use of alcoholic wine, for instance (Ps. 104:14-15; Matt. 26:27-28; 1 Tim. 5:23). The Scriptures are clear, however, that drunkenness is a sin (Prov. 23:29-31; Isa. 5:11; Rom. 13:13; etc.). The Lord explains to us through St. Paul how it might be necessary to refrain from certain freedoms that we would otherwise have, so that others will not be led astray (see Rom. 14 and 1 Cor. 8). This would be another good reason to abstain from drinking alcohol. It is clear, though, that the moderate use of alcohol need not be a sinful thing, assuming that it does not lead to drunkenness and does not set a trap for others to fall into. The use of alcohol, therefore, is a good example of an adiaphoron, something we may or may not do in a God-pleasing way, depending on the circumstances. Some think the Bible does not speak about gambling at all; therefore the church should not attempt to teach right and wrong regarding it. Others think that gambling is almost always a sin against the seventh commandment, a form of stealing; therefore it should be soundly condemned. In between are the majority, we think, who see gambling as an adiaphoron. Therefore the individual Christian may make his or her own decision regarding it, depending upon the circumstances . . . to say “gambling is sinful” is a blanket statement difficult to prove from Scripture in all situations. Thus, in the Northwestern Lutheran, the Wisconsin Synod legitimized lotteries and casino gaming as matters of Christian choice and judgment. 5 This conclusion is incorrect, and the Wisconsin Synod has done its members a disservice by making allowances for these worldly things. The desire to gain as a result of someone else’s loss is always a desire that is born of the flesh, and not of God. As such, it is not something to ponder and then enjoy in moderation. Rather, it is something to be avoided as much as possible. Our conclusion must be, then, that gambling (at least in the case of casino gaming and lotteries) is not a matter of Christian liberty at all, since it is invariably bound together with coveting, poor stewardship, and disregard for the well-being of one’s neighbor. Conclusion — Is this our biggest problem? With all the violence, immorality, and godlessness out there in the world, is it really worthwhile to focus our attention on what many consider to be a harmless activity, or at worst, a minor vice? Isn’t all the false doctrine that is being propagated, to the great harm of many souls, of far greater consequence? It is true that our role in the world as believers is to be witnesses to the truth of the gospel. It would not be right to have, as our main objective, the cleaning up of social ills. Neither would it be right to conclude that someone who has purchased a lottery ticket or visited a casino must therefore be an unbeliever. Our commission is to use the means of grace, the proclamation of law and gospel, so that sinners can know their lost condition and find in Christ their full salvation. That having been said, it should be a cause for grave concern that our entire society has, in recent years, been given over to the promotion of legalized gambling. It should be a cause for grave concern that, where churches once firmly denounced the ill-gotten gains of gambling for Scriptural reasons, they are now making allowances for it, for earthly reasons. We should not be hesitant or ashamed to speak out against the worldly influences that war against our souls, whether or not most people consider them to be of minor consequence. Rationalizations for gambling and exceptions to the rule can go on endlessly. “My buddies and I play golf, and we wager a nickel a hole. Is there really any harm in that?” One could well answer: Isn’t the scorecard enough? But why waste time discussing every possible example of a “gray area”? Any moral question can be argued to its logical extremes and be made to look ridiculous. That does not take away from the principle of the matter, which is God’s command to work with our hands, be content with what we have, and not to yearn after a quick gain from other people’s losses. When we do refrain from going along with the world’s infatuation with “Lady Luck,” what should our motivation be? Surely, it should not be legalism, pride in personal holiness, or a feeling of superiority over others. Rather, we should be motivated by the gospel of a crucified Lord, thankfulness for God’s many blessings, and an eager desire to do all things for His glory. Then, our life and conduct will be a clear witness that speaks of the Lord’s grace shown to us. May the Lord so lead us in His own right way. Grams, Rick — “Recreational Gambling,” presented to the Minnesota Delegate Conference, September 1987. Libby, Douglas — “Observations from Scripture Regarding Participation in State-sponsored Lottery,” presented to the Minnesota Pastoral Conference, November 1994. Lutheran Sentinel, (ELS), June, 1997. The National Coalition Against Legalized Gambling Homepage, www.ncalg.org. Northwestern Lutheran (WELS), January – April, 1988. Sydow, Michael — Martin Luther’s Small Catechism.